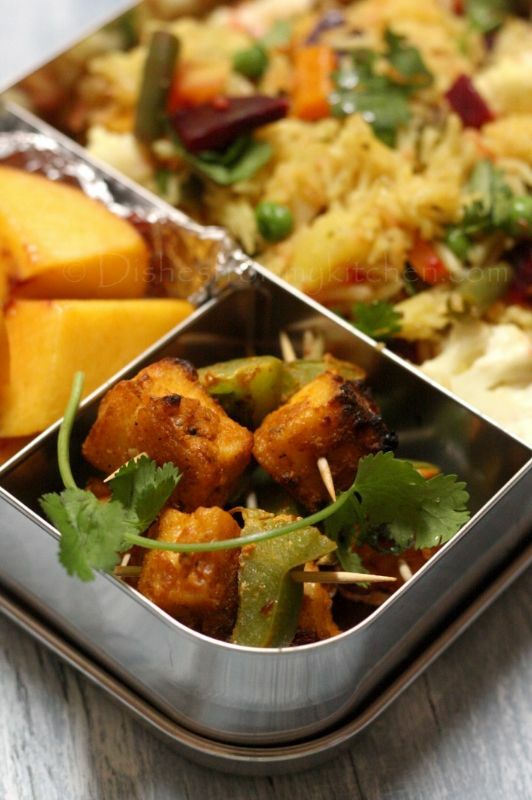 Dishesfrommykitchen: KIDS LUNCH BOX - VEGETABLE PULAO(VER I), TAWA PANEER TIKKA ! 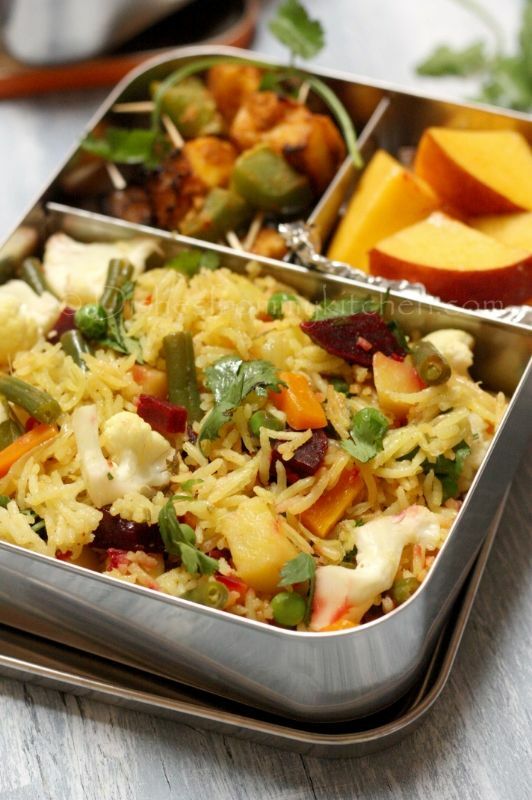 KIDS LUNCH BOX - VEGETABLE PULAO(VER I), TAWA PANEER TIKKA ! 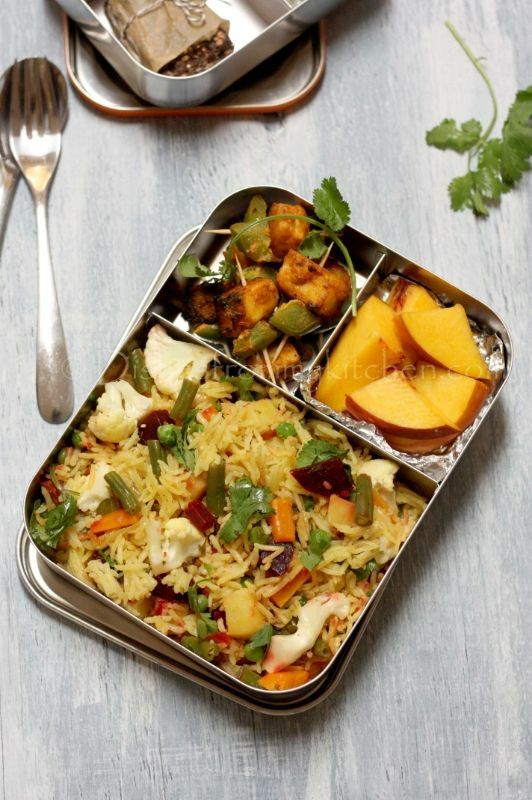 LUNCH BOX : VEGETABLE PULAO, TAWA PANEER TIKKA, PEACH ! Grind the above to coarse paste. 1. Heat oil in the pressure pan. When oil is hot add the whole spices, when it pops. Add the onion sauté till they are slight brown in color. 2. Now add the ground paste till the raw aroma disappear. 3. Parallely wash the rice and keep aside. 4. Now add tomato, they become slightly mushy. Now add the vegetables except beetroot. 5. Add the chopped mint leaves, turmeric powder and garam masala. Drain the rice and keep it aside. 6. Now add 3 cups of boiling water to vegetable mixture. Add drained rice and salt. Keep the flame in medium. 8. Open the pressure pan top it with the beetroot. Now close with the lid. 9. Keep it in very minimum flame. Switch off after 10 to 12 minutes. Do not disturb for 10 to 15 minutes. 10. Open the lid, add lemon juice and chopped cilantro. Fluff it up with fork. Serve it with Raita and Pappad. 1. Beetroot is added later to avoid the whole rice turning to purple color. 2. I did add Cauliflower the same way along with beetroot. Because cauliflower tends to get mushy here in US if I add them earlier along with other veggies, I think its because of more water content in the vegetable. So its upto you, do it the way you like. 1. Cut Paneer to small cubes. 2. Make Ginger + garlic paste. 3. In a small bowl whisk all the above ingredients. Add the paneer cubes in the yogurt mixture, toss everything so that paneer is well coated. 4. Close the bowl and keep it aside for couple of hours or even overnight in the refrigerator. 5. Now heat oil in non stick pan arrange the Paneer pieces keeping them in medium flame (Reserving some extra yogurt mixture to toss the bell peppers). 6. In the same bowl, add the capsicum toss it and roast them in the same pan. 7. Sprinkle some chaat masala along with some lemon wedges. 8. You can also serve with Mint chutney or Mint yogurt dip. 1. Adjust Spice , salt and sourness according to your preference. QUINOA AND LENTIL (DHAL) ADAI / CHEELA !!! DARK CHOCOLATE POPCORN BARS - SNACK BOX RECIPE ! 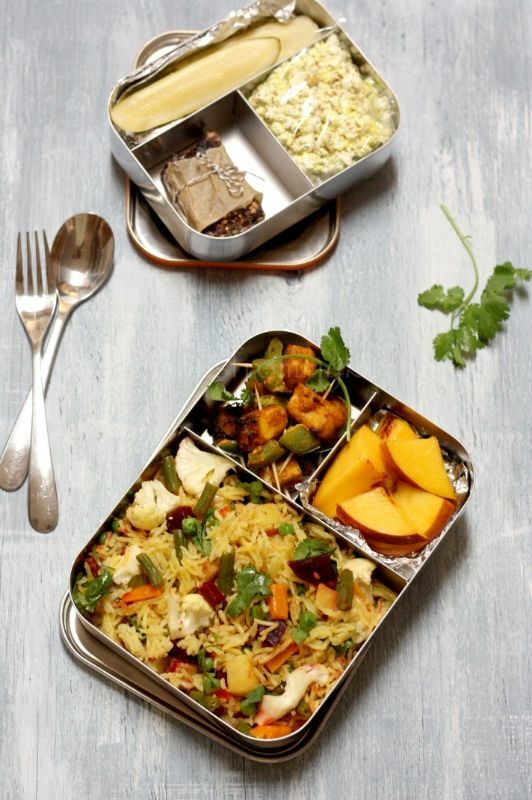 KIDS LUNCH BOX - LEMON POHA / BEATEN RICE UPMA ! KIDS LUNCH BOX : EGG CHEESE PARATHA ! KIDS LUNCH BOX : ALOO/POTATO TIKKI WRAP ! KIDS LUNCH BOX - MINI COLORFUL UTTAPAMS/DOSAS ! KIDS LUNCH BOX - ROASTED VEGGIES PESTO FARFALLE ! KIDS LUNCH BOX - COCONUT RICE AND POTATO FRY ! KIDS LUNCH BOX - VEGETABLE CHAPPATHI NOODLES ! KIDS LUNCH BOX - PANIYARAM/ INDIAN EBELSKIVER ! 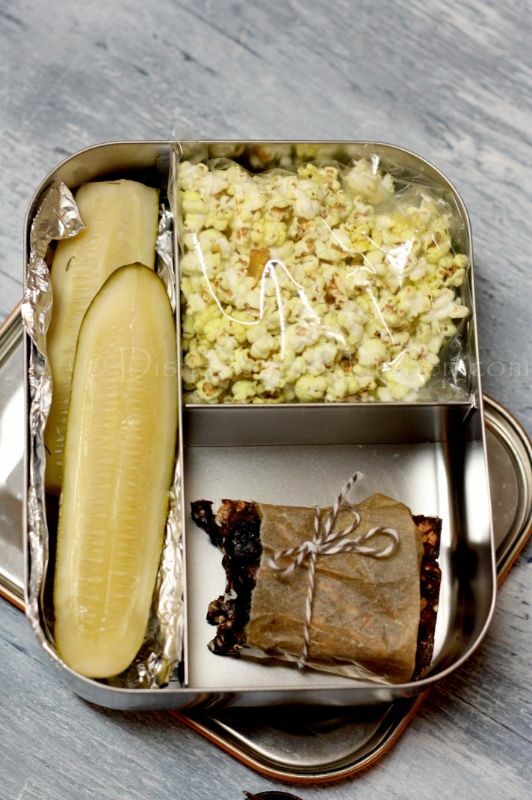 KIDS LUNCH BOX - MINTY QUINOA ! KIDS LUNCH BOX - VEGETABLE CHOW MEIN !